Our company, Jindal Rolling Mills Ltd, has redefined the level of construction by manufacturing a comprehensive range of TMT 500D Bars. These TMT Bars are designed by our talented engineers and are acknowledged for their earthquake resistant design & high tensile strength. Offered TMT 500D Bars are purified in accordance with international quality standards and contains Phosphorus & Sulphur, so that construction is not affected by any weather conditions. Although Phosphorus & Sulphur are known to make rebar susceptible to breaking, as these are unwanted foreign matter. Our TMT 500D Bars follows the BIS detailing and reduce the foreign matter to 0.075%. 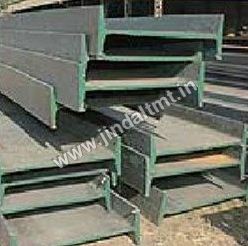 Moreover, Jindal 500D TMT Bars are appreciated for their corrosion resistance, rugged design and are available in various sizes, according to the customers’ requirement. Furthermore, our TMT 500D are preferred for their reliability, durability and can be obtained at pocket friendly prices. We mainly cater for clients based in Delhi & NCR, Haryana, Jaipur, Rajasthan. With rich industrial experience, we are renowned as one of the leading manufacturers and suppliers of excellent quality TMT Steel Bar which is widely used for bridge and building constructions. The offered bar is manufactured by our experienced professional using superior quality steel and modern technology. This TMT Steel Bar is highly appreciated by our clients as it is described as a new-generation-high-strength steel having superior properties such as weld ability, strength, ductility and tensity, which meet the highest industries quality standards. Backed by rich industry experience and knowledge, we have been able to manufacture and supply a broad range of MS Channel that is used in metal docking, space frame towers, prefabricated shelters and per-engineered building systems. Offered channel is precisely manufactured by our diligent professionals by utilizing high grade mild steel at our well-equipped manufacturing unit. Furthermore, this MS Channel can be availed in different specifications by our customers. Owing to our expertise in this domain, we are engaged in manufacturing and supplying excellent quality MS Flat Sections that are widely used for construction purpose. The offered sections are used in various versatile fabrication applications. These sections are widely demanded and are manufactured with the utmost precision of our deft professionals using optimum quality mild steel and advanced technology. Besides, the offered MS Flat Sections can be availed from us in diverse technical specifications as per the clients’ variegated requirement. Our proficiency and knowledge of this domain has enabled us to come up as a reliable manufacturer and supplier of Iron rod. The offered rod is available in different sizes, thicknesses, lengths and dimensions to suit the demands of customers in an efficient manner. Equipped with modern machinery and technology, we have been able to offer this rod in bulk quantity. Our offered Iron rod is appreciated for features like easy installation and corrosion resistance. Gained prominence in the industry as an enviable manufacturer and supplier, we are engaged in offering a wide range of Iron & Steel Bars. Widely demanded in construction, refineries and cement industries, the offered bars are offered in different specifications to suit the demands of customers. Post-production, the offered bars are checked on the basis of tensile strength and finish to ensure flawlessness. Iron & Steel Bars are available at industry leading prices. Since our commencement in the year 1987, we are well-known in the industry as an eminent manufacturer and supplier of TMT 500D Bar. Applicable in residential & commercial developments, the offered bar is manufactured in different sizes to meet the exact demands of customers in efficient manner. To manufacture the offered bar, we make use of high-grade raw materials, obtained from reliable vendors of the industry. Our offered TMT 500D Bar is appreciated for rugged construction and rust resistance. With the firm commitment towards quality, we are engaged in manufacturing and supplying SS TMT Bar. Owing to its features like corrosion resistance, high tensile strength and lightweight, our offered bar is applicable in building construction and automobile industries. Additionally, meeting the exact demands of customers, we have gained huge client-base. Our offered SS TMT Bar is dispatched within committed time to attain maximum client contentment. Owing to our state-of-the-art infrastructure facility, we have been able to manufacture and supply Steel TMT Bar. Under the guidance of expert professionals, the offered bar is manufactured with perfection in tandem with the industry set norms and guidelines to attain highest benchmarks of quality. Without compromising with the quality of offered bar, we offer the same at industry leading prices. Steel TMT Bar is stored at our warehouse facility, which is segregated properly. Our two decades of experience enables us to manufacture and supply Stainless Steel TMT Bar. For its study construction, tremendous tensile strength, easy installation and corrosion resistance, the offered bar is demanded in construction industry. In order to meet the demands of clients, we are providing this bar in different specifications. Stainless Steel TMT Bar is smooth in surface and finish. Also, we are offering this TMT bar at market leading prices.